0	0	John	In Stock - Order before 4pm for same day dispatchWant it on Wednesday 24 April? Often in detective stories, a seemingly irrelevant detail is the essential clue to solving the mystery. Tom Wright suggests that the writer of John's Gospel had a similar idea in mind; nothing is there by accident. All the details in this most profound of the Gospels work together to tell an amazing story and reveal an astonishing secret: nothing less than the story of God and the world. These twenty-six studies on John show us not just the story of one character in one place and time but the Creator God acting in a new way within his beloved creation. 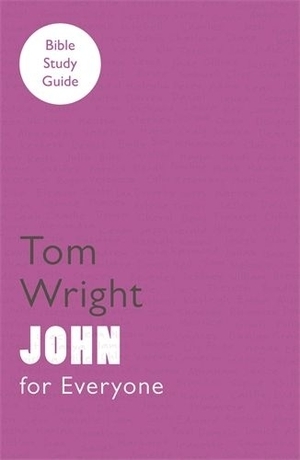 John by Tom Wright was published by SPCK in February 2010 and is our 12627th best seller. The ISBN for John is 9780281062256. One of a series of guides written for use by individuals or groups, developed from Tom Wright’s New Testament for Everyone series, where he has translated the New Testament afresh. At the beginning of each of the books in this series, Tom Wright talks about the individual book and then gives suggestions and guidance for individual use, then group use. At the end of each book are Guidelines for Leaders enabling those with no experience of leading to feel confident and capable of doing a good job. Because of the varying lengths of the books, there are different numbers of sessions outlined, so be prepared to accommodate this in your planning. Tom Wright encourages individuals whether on their own or in groups to think seriously how the reading for the session speaks to them as individuals and as members of the church. He writes notes to aid the thoughts or discussions and of course more information is in the relevant book in his New Testament For Everyone series.